I can’t say enough about Canny, the 1992 Cannondale 3.0 that I purchased new on September 16, 1993. 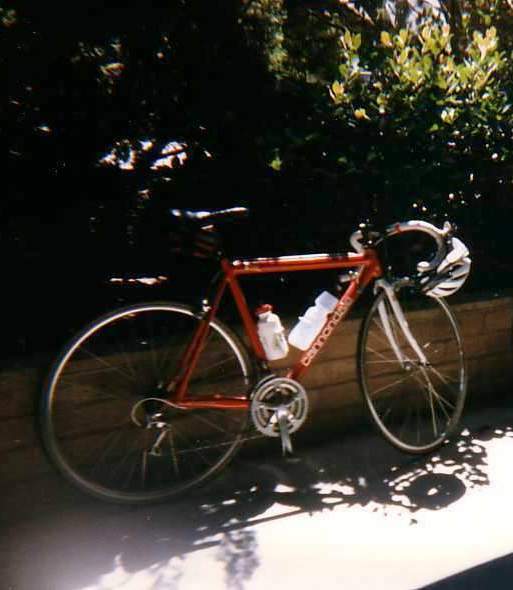 My all-time favorite bicycle, she’s been reliable, economical, exhilarating, not to mention super-stiff, very light (for her vintage), very fast, and downright gorgeous. As of the end of 2014 we have traveled 34,000 miles together, including Paris-Brest-Paris and several dozen other ultra-marathon bike rides. She also got triathlon duty from 2003-2006. Despite the advances in bicycle technology over the last decades, Canny remains a viable, raceable machine. Case in point: her 53-cm frame weighs 3.1 lbs., which is reasonable for a frame even today. The Cannondale 3.0 was the stiffest frame tested on Bicycling Magazine’s Tarantula test fixture in the early 1990s, and since then Cannondale designed more flex into their frames for a more comfortable ride. Yet as I can attest from the several dozens of double centuries I have done, Canny does not “beat me up”. The tires, saddle, and handlebar padding contribute much more to ride comfort than frame flex or material. See my 10-year photo tribute to Canny here for years 1993-2003, and a 20-year tribute written in 2013. Cost for complete bike, brand new, from Noe Valley Cyclery in San Francisco on September 16, 1993: $599 + tax = $648.42. Adjusting for inflation, this is $916 + tax = $991.73 in 2010 dollars. The component gruppo was mainly Shimano RX100—which was essentially the same as Shimano 105 at the time except that its parts had a nice clear-coated finish over bare aluminum instead of grey paint like 105—and had a front triple crankset (kind of a rarity at the time), 7-speed rear cluster, downtube indexed shifters and toe clips and straps. Rims Mavic MA2 Like the Mavic MA40 but without anodization. Front one cracked after a couple years near the spoke holes. Tires Michelin (Select???) 700x23c. They retailed for $7 at the time; had a steel wire bead, yellow/tan “white walls” as was typical of the times and low thread count; rode poorly and did not last long. Front Derailleur Suntour Blaze? Definitely was a Suntour stainless-steel derailleur. Stem forged aluminum quill, negative rise, 11cm? Black color with no logos. Headset Suntour Black cups. Became notchy after 4-5 years. *estimated weight from literature. No asterisk = measured weight. From 1994-1997 I used Sampson Stratics clipless pedals before going to Speedplay. In 1997 I upgraded the wheelset to heavy-but-aerodynamic 30mm-deep Mavic CXP-30s and the rear shifter to Shimano 105 STI 8-speed (I kept the left downtube lever). A Campagnolo Racing T crankset went on in March 1999. See the post, “Canny goes on a diet” for her components from June 1999 onward. Below is a photo of how she looks in November 2015. Congrats on the 10 yr. anniversary. I came across your site as I was looking for some info on my newly aquired Cannondale 3.0. I bought it from a bike shop in a college town where a guy crapped it up by spraypainting it to look like a junker to ride on campus. I guess he moved on and traded it in on another bike because it was stripped to the frame. I bought it for 25.00 and proceded to the paint shop where it was blasted and a hot coat of metalic copper paint was applied. The decals will be in and soon and the other components I ordered and it will be on the road by spring. ‘The Veteran flies again!’ will be its theme. Email me and please tell me what you can about the design and riding. I am glad I am not the only one with such a cool bike. I enjoyed your site. And great to hear that you are happy with Canny. I hope you still have her beside you. Any how, I was searching information on my bike. I have a Cannondale 3.0 Criterium (Red and White). I purchased the bike recently and I am enjoying the bike as well. However, I can not find any info on my bike and I was woundering if you would happend to know? I can send you a picture of my bike. It doesnt look like yours but similar. Please let me know.. Thank you. Congratulation to you and Canny. I saw a red with white Cannondale this morning in a second hand shop. Its written there 3.0 CRITERIUM and gears and brake sets are Shimano 105. Other than that I don’t know anything about the bike including manufacturing year. The cost is about US$200. I’m still thinking of buying it or not. For info, it is not easy to find a used Cannondale bike here in Malaysia. I will send a photo if I got the chance. Please give any comment. Thank you. I’m racing on a Cannondale 2.0 from 1989! I got it new in ’89, but hardly used it until 2004 (it had been my TT bike). So I’ve been training/racing on it for three years now. 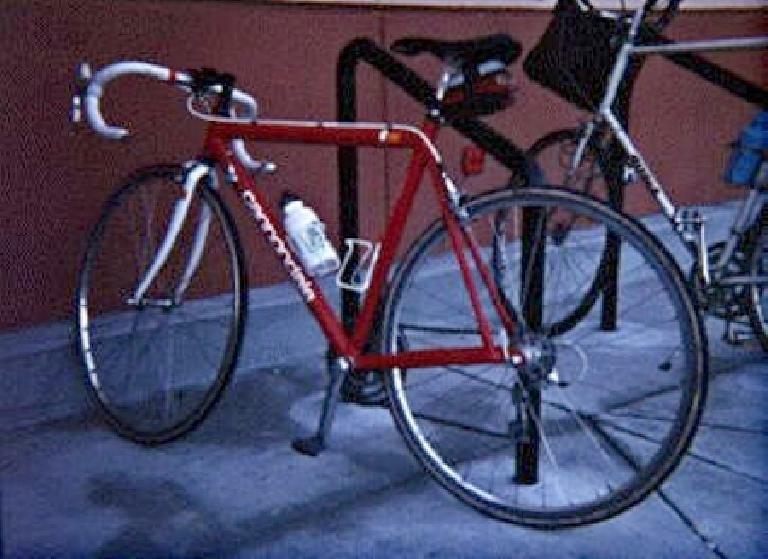 In 2005, I moved up to indexed shifting with a used set of Ultegra 8-speed shifters. My team is aghast, seeing me line up at a big race with this late ’80’s production. Fellow 40+ racers have reported marital problems as their wives find out how cheaply I race! Ooooops! My team is offering me a CAAD 9 frame + carbon fork for $450, and I am tempted, but my heart is still in the ole Blue from yesteryear… Gotta get you a photo… Cheers! – P.
Nice Bike. However, really wondering which seat bag you have attached in many of your photos. Its so hard to find a decent expandable seat bag, especially with such large reflective panels. I’m not familiar with yours and hope that model is still available somewhere. Thanks, bro! What campy group are you using.I want to up grade my cannondale. i have blue one and love it,but when is it time to get a new one? Funny, I think I am riding the same frame Philippe is riding, a Cannondale 2.0 in blue with yellow sponge prints on the frame. It’s so retro, has the original Wolber rims on it (now creaking with each revolution in the rear), and weighing in at 23 lbs with the original equipment, a real chore to hillclimb with. After having a female riding partner admonish me for the last time, I went and bought a used Giant TCR Advanced SL frameset outfitted with Dura Ace 7800 and Ksyerium wheels off eBay. No doubt it’s a smooth ride, but I expected the thing to launch fast enough to give me whiplash. Nope! It will be interesting to do a longer ride with the bike though. I guess I’ve always wondered why I never bought a new bike over all these years, now I know! I’ve got an ’89 SR2000 that my dad bought me as a teenager when I was pretty deep into road racing. She’s a hyper-highlight blue, criterium 3.0 frame with Dura-Ace 8 speed and tubulars. Her gearing was definitely set up for racing and is a far cry from today’s compact crank setups. She came stock with a 39×53 crank and 12×19 cogset. Not a climbing gear anywhere which was a bear. My knees were teenage knees at that point and I thought I was indestructible. I had been riding steel prior to that, columbus tubing Bianchis and this bike was way stiffer and much more responsive. The ride however was quite harsh. Got out of competitive biking for a while and then got back into serious mountain biking and my road bikes sat for quite a while. I’ve since evolved again and have started road riding more. I upgraded my Cannondale with aero clinchers rims and still get out and hammer her quite a bit. The bike is still very quick and of course still harsh. She weighs in about 20 lbs. so still somewhat respectable. I’ve not raced her since the early nineties but have done several organized rides and she gets a lot of comments. I’ve even done RAGRAI on her, she only beats me up because she loves me. Since she just turned 21 this summer. I occasionally let her drink but only in moderation, she’s pretty fond of a strong belgium. Can you tell I still love the ol’ girl. 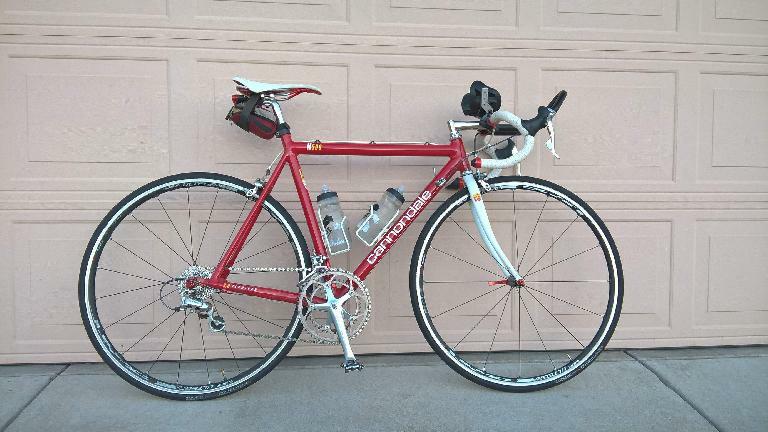 Nice site… I just picked up a sweet cannondale 3.0 with shimano 105 gears ,brakes etc I think its an 89 …bought it for 45.00 bucks !!! Brought it to the shop here in CT where the bike was built ,the guys told me it was never ridden !!! Super clean !!! Looks and rides like new !!! Did 30 miles this morning with ease…. I love this bike !!!! … yipee yipee !!!! Ooops wording error …I brought Dale … thought I would name my bike ..lol to a bike shop in Niantic Ct …not where they actually built it ,I guess from what I read they are made overseas now .. I love this Road bike !!. Dale will. be with me for a long time …along with some other nice rides. I’ve been on mountain bikes for a while… it is pretty sweet to be on the road. Good story Scot !! I occasionally let her drink. lol… Happy Bithday ol girl..
Hey Thanks a ton for this site, this is the only spec guide I could find for this bike. 2 questions, do you know if the frame height is center to center or center to top, I’m assuming center to center. Secondly do you know the length of the top tube and/or the stem length? Any help would be much appreciated! I’m trying to revive an old 3.0 series canny for my new daily rider and your site has given me alot of info and inspiration! Hi Alan. The frame height is actually center to a little bit over the top; Cannondale was notorious for measuring it this way with the 3.0s and I just verified that by measuring my own frame. The length of the top tube is 53 cm. The stem that came with my bike was 11cm. Good luck reviving your 3.0! Felix again just wanna thank you for this blog has been the deciding factor on whether to buy a new bike or bring the canny back to life. I’ve finally decided on the latter. The frame size matches perfectly to my inseam. As far as I can tell it only needs a tune up and some tlc. I’m about to order a wheel set and I’m still new to this. Do I need freewheel or what cassette will I need and what’s a good inexpensive wheelset to look for. Just building up a cad 3 frame but standard 27.2 was too wide even though a website stated all Cannondales have 27.2.So your correct 27 info.is useful.I am over in Berkeley. Stanford looks like nice riding area.Sf is so crowded! Hi Allan, thanks for stopping by my website and for your comment. The 270 I listed on the page was actually the weight in grams of the seat post, but I just measured the diameter of the post using digital calipers and it is in fact 27.0 mm. Since I took the seat post from a Cannondale CAD3 and put it on my Cannondale 3.0, I can confidently say your CAD3 frame has a 27.0 mm seat post. Have a good time cycling in Berkeley! I am going to go for quick ride myself right now. I have a 55 1992 cannondale r600 and i was having work done on it with the gears and the bottom tube shifter mount internally piece was cracked and just fell apart. Does anyone know where i can find one and what the size of where the bottom tube mount is at is? Will be a great help because the bike is usuless without it.